Weatherstripping is one of the best ways to save money on energy costs as, when used properly, it will create a tight seal between building components reducing air leakage around doors and windows. Weatherstrip is recommended on movable components, while caulk or silicone is the best material for filling openings with stationary components. When selecting the right weatherstripping material take into consideration weather, traffic or movement, temperatures and the place where it will be installed. Metal weatherstripping can also provide a nice touch to older homes where vinyl might seem out of place providing very pleasant aesthetic looks. A tension seal, also known as V strip, is a rigid strip folded into a ‘V’ shape used to bridge a gap. The weatherstrip material creates a tight seal by pressing against the sides of a crack. It is normally used as a weatherstripping material along the sides of windows, and top/sides of doors. Its cost varies depending on much material is used, which is cut to the desired length. It is very effective when in place and easy to install. However, the tension weatherstripping seal must be used only in flat smooth surfaces. When a metal tension seal is used, it must be nailed in place every four inches, and in certain instances, it can increase resistance in opening or closing doors and windows. Reinforced foam is a closed cell type attached to wood or metal strips. It is an affordable material that could be used on doors and windows, that is easy to install and an effective sealer under wind and humid conditions. It's sold in varying widths and thicknesses, which makes it best for irregular-size cracks. The weatherstripping foam can be difficult to install and must be sawed, nailed and painted. 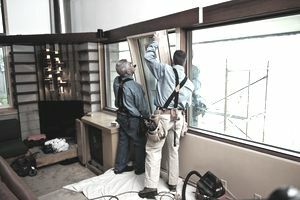 It works better when installed at window stops and on the bottom or top of a window sash. Felt is sold in rolls and comes plain or reinforced with a flexible metal strip. Felt weatherstripping must be stapled or glued into place and will normally last a year or two. It can be installed around a door or window or pressed against a door jamb. Felt is one of the most inexpensive weatherstripping materials and will decay rapidly. It cannot be installed if it will be in contact with water. This one is ideal for low traffic areas. All-wool felt is the more durable yet expensive felt-type product. Felt is the most economical weatherstripping material available. Rubber or vinyl weatherstripping material creates an effective air barrier, attached to a wood or metal strip. It can be installed at the base of doors and windows, in window sash, or between a door and its jamb. It normally comes as a self-stick product, available at a higher price than other weatherstripping materials, and it is somewhat difficult to install. It can provide an effective air barrier but the cost might be a little higher than the average product. Rolled or Reinforced Vinyl - Rigid strip gasket that sometimes might not adhere to metal. Door Sweep - Metal with a plastic brush. Really easy to install but might drag on carpet unless automatic sweeps are used. Interlocking metal channels - Best weather seal, Very difficult to install as alignment is critical. Remember always to ask for at least 10 percent of additional weatherstripping material, and also consider that weatherstripping comes in varying depths and widths, that will depend on where you are going to install it.